The Consumer Protection Act, 1986 - Sections 2 (r), 23 - ‘unfair trade practices’ - A term of a contract will not be final and binding if it is shown that the flat purchasers had no option but to sign on the dotted line, on a contract framed by the builder. The contractual terms of the Agreement dated 08.05.2012 are ex-facie one-sided, unfair, and unreasonable. The incorporation of such one-sided clauses in an agreement constitutes an unfair trade practice as per Section 2 (r) of the Consumer Protection Act, 1986 since it adopts unfair methods or practices for the purpose of selling the flats by the Builder. The Consumer Protection Act, 1986 - Sections 2 (r), 23 - ‘unfair trade practices’ - The terms of the Apartment Buyer’s Agreement were wholly one-sided and unfair to the Flat Purchaser. The Builder could not seek to bind the Flat Purchaser with such one-sided contractual terms. (UDAY UMESH LALIT) AND (INDU MALHOTRA) JJ. 1. The present statutory Appeals have been filed under Section 23 of the Consumer Protection Act, 1986 to challenge the Final Judgment and Order dated 23.10.2018 passed in Consumer Case No. 238 of 2017 and Consumer Case No. 239 of 2017 by the National Consumer Disputes Redressal Commission (hereinafter referred to as “the National Commission”). 2. Since a common issue arises in both the Civil Appeals, they are being disposed of by the present common Judgment and Order. 3. For the sake of brevity, the facts in C.A. No. 12238 of 2018 are being referred to, being the lead matter. 3.1. The Appellant – Builder launched a residential project by the name “Araya Complex” in Sector 62, Golf Course Extension Road, Gurugram. The Respondent – Flat Purchaser entered into an Apartment Buyer’s Agreement dated 08.05.2012 with the Appellant – Builder to purchase an apartment in the said project for a total sale consideration of Rs. 4,83,25,280/-. As per Clause 11.2 of the Agreement, the Appellant – Builder was to make all efforts to apply for the Occupancy Certificate within 39 months from the date of excavation, with a grace period of 180 days. 3.2. The excavation of the project commenced on 04.06.2012. As per Clause 11.2 of the Agreement, the Builder was required to apply for the Occupancy Certificate by 04.09.2015, or within a further grace period of 6 months i.e. by 04.03.2016, and offer possession of the flat to the Respondent – Flat Purchaser. The Appellant – Builder however failed to apply for the Occupancy Certificate as per the stipulations in the Agreement. 3.3. The Respondent – Flat Purchaser filed a Consumer Complaint before the National Commission on 27.01.2017 alleging deficiency of service on the part of the Appellant – Builder for failure to obtain the Occupancy Certificate, and hand over possession of the flat. • • Litigation Costs of Rs. 1,00,000/-. 3.4. On 06.02.2017, the National Commission passed an ex-parte Interim Order restraining the Appellant – Builder from cancelling the allotment made in favour of the Respondent – Flat Purchaser during the pendency of the Consumer Case. 3.5. During the pendency of the proceedings before the National Commission, the Appellant – Builder obtained the Occupancy Certificate on 23.07.2018, and issued a Possession Letter to the Respondent – Flat Purchaser on 28.08.2018. 3.6. The Appellant – Builder submitted before the National Commission that since the construction of the apartment was complete, and the Occupancy Certificate had since been obtained, the Respondent – Flat Purchaser must be directed to take possession of the apartment, instead of directing refund of the amount deposited. 3.7. The Respondent – Flat Purchaser however submitted that he was not interested in taking possession of the apartment on account of the inordinate delay of almost 3 years. The Respondent – Flat Purchaser stated that he had, in the meanwhile, taken an alternate property in Gurugram, and sought refund of the entire amount of Rs. 4,48,43,026/- deposited by him along with Interest @18% p.a. 3.8. The National Commission vide Final Judgment and Order dated 23.10.2018 allowed the Consumer Complaint filed by the Respondent – Flat Purchaser, and held that since the last date stipulated for construction had expired about 3 years before the Occupancy Certificate was obtained, the Respondent – Flat Purchaser could not be compelled to take possession at such a belated stage. The grounds urged by the Appellant – Builder for delay in handing over possession were not justified, so as to deny awarding compensation to the Respondent – Flat Purchaser. The clauses in the Agreement were held to be wholly one – sided, unfair, and not binding on the Respondent – Flat Purchaser. However, for the period when the Interim Order dated 06.02.2017 was in operation, which restrained the Appellant – Builder from cancelling the Respondent’s allotment, no Interest was awarded. The National Commission ordered payment of Interest from the date of each installment till 05.02.2017; and from the date of the Order passed by the Commission till the date on which the amount would be refunded. 3.9. Aggrieved by the Order dated 23.10.2018 passed by the National Commission, the Appellant – Builder preferred the present statutory Appeal under Section 23 of the Consumer Protection Act, 1986. “11.5. (ii) In the event of further delay by the Developer in handing over of the possession of the Unit even after 12 months from the end of grace period, then in such case, the intending Allottee shall have an additional option to terminate this Agreement by giving termination notice of 90 days to the Developer and refund of the actual installment paid by him against the Unit after adjusting the taxes paid / interest / penalty on delayed payments. (iv) Developer shall, within ninety (90) days from the date of receipt of termination notice of said Unit, refund to the intending Allottee, all the monies received excluding the service tax collected on various remittances, till the date of the refund, from the Intending Allottee under this Agreement. In case the Developer fails to refund the Sale Price, the Developer shall pay interest to the Intending Allottee @ 9% per annum for any period beyond the said period of ninety (90) days. The Intending Allottee shall have no other claim against the Developer in respect of the said Unit along with the parking space. The Intending Allottee in this event shall have no right to seek any compensation apart from the interest as stipulated herein. (v) If the Intending Allottee fails to exercise his right of termination within the time limit as aforesaid, by delivery to the Developer of a written notice acknowledged by the Developer in this regard, then he shall not be entitled to terminate this Agreement thereafter and he shall continue to be bound by the provisions of this Agreement, provided that in such case, the Developer shall continue to pay the compensation provided herein. 4.1. It was submitted that the Respondent – Flat Purchaser was not entitled to refund of the amount deposited, since the Apartment Buyer’s Agreement was not terminated by the Respondent – Flat Purchaser in accordance with Clause 11.5 (ii) of the Agreement, which stipulates that the allottee has to terminate the Agreement by giving a Termination Notice of 90 days to the Developer. Since the Respondent – Flat Purchaser had not terminated the Agreement by a written notice as per Clause 11.5, the Builder could not sell the apartment, and refund the money to the Respondent – Flat Purchaser. On the contrary, the Respondent filed a Consumer Complaint and obtained an ex-parte Interim Order dated 06.02.2017 restraining the Builder from cancelling the allotment made in favour of the Respondent. 4.2. It was further submitted that if the filing of the Consumer Complaint is considered as an act of termination of the Agreement, then the same was pre-mature. As per Clause 11.5 (ii), the Respondent – Flat Purchaser could have claimed refund only after the expiry of 12 months after the grace period came to an end i.e. after 04.03.2017. However, the Consumer Complaint was filed on 27.01.2017. In these circumstances, even if it is found that the Appellant – Builder is liable to refund the amount deposited with Interest, then the date of the Impugned Order i.e. 23.10.2018, must be treated as the date of serving the Termination Notice as per Clause 11.5 (ii) of the Agreement, and the Appellant – Builder should be held liable to pay Interest only after 90 days from the date of termination i.e. from 23.01.2019. 4.3. With respect to rate of Interest awarded by the National Commission, it was submitted that the Commission erred in granting Interest @10.7% S.I. p.a. even though Clause 20 of the Agreement provided Interest @6% p.a. in case of delay in handing over possession. Even under Clause 11.5 of the Agreement, the Builder was liable to pay Interest @9% p.a., but not @10.7% S.I. p.a. The learned Senior Counsel relied upon this Court’s Judgment in Bharathi Knitting Company v. DHL Worldwide Express Courier Division of Airfreight Ltd., (1996) 4 SCC 704. and submitted that the National Commission could not have granted compensation in excess of the rate prescribed by the Agreement. 5. Mr. Sushil Kaushik, learned Counsel represented the Respondent – Flat Purchaser. 5.1. It was submitted that the filing of the Consumer Complaint may be treated as his Termination Notice under Clause 11.5 (ii) of the Agreement. Under the Agreement, the Builder was obligated to apply for the Occupancy Certificate within 39 months from the date of excavation, with a grace period of further 6 months. The period got over by 04.03.3016 after taking into account the grace period. Admittedly, the Appellant – Builder offered possession after an inordinate delay of almost 3 years on 28.08.2018. On account of the inordinate delay, the Respondent – Flat Purchaser had no option but to arrange for alternate accommodation in Gurugram. Hence, he could not be compelled to take possession of the apartment after such a long delay. It was in these circumstances that the Respondent – Flat Purchaser sought stay of the cancellation of the allotment as a collateral, till his claim for refund was adjudicated by the National Commission. 5.2. It was further submitted that the Clauses of the Agreement were one-sided. As per Clause 6.4 (ii) of the Apartment Buyer’s Agreement, the Appellant Builder could charge Interest @18% p.a. for delayed payments. However, the Appellant – Builder was not required to pay equivalent Interest to the Respondent – Flat Purchaser for delay in handing over possession of the flat. On the contrary, as per Clause 11.5 (iv) of the Agreement, in case of delay on the part of the Appellant – Builder in handing over possession of the flat, the Respondent – Flat Purchaser was entitled to Interest @9% p.a. only. 5.3. The Respondent further submitted that the National Commission had ordered payment of Interest as per the statutory Rules i.e. Rule 15 of the Haryana Real Estate (Regulation and Development) Rules, 2017 @10.7% S.I. p.a. The Respondent – Flat Purchaser submitted that he had obtained a loan for Rs. 3,30,00,000/- from Standard Chartered Bank to purchase the flat in question, and had entered into a Tripartite Loan Agreement with the Bank and the Builder. The Respondent – Flat Purchaser had to pay Interest @10% p.a. for servicing the loan for the entire period. Hence, Interest @10.7% S.I. p.a. awarded by the National Commission was just and fair. It was pointed out that even though the National Commission had not granted Interest for the period during which the Order of stay of cancellation of the allotment was in operation, the Respondent – Flat Purchaser had to pay Interest to the Bank even for this period. 5.4. The Respondent – Flat Purchaser submitted that the present Appeal be dismissed, and the Builder be directed to pay the amount awarded by the National Commission with Interest, within 1 week, so that the Respondent can discharge his loan liability. 6. We have heard the learned Counsel for both the parties, and perused the pleadings, and written submissions filed. 6.1. In the present case, admittedly the Appellant – Builder obtained the Occupancy Certificate almost 2 years after the date stipulated in the Apartment Buyer’s Agreement. As a consequence, there was a failure to hand over possession of the flat to the Respondent – Flat Purchaser within a reasonable period. The Occupancy Certificate was obtained after a delay of more than 2 years on 28.08.2018 during the pendency of the proceedings before the National Commission. In Lucknow Development Authority v. M.K. Gupta, (1994) 1 SCC 243. this Court held that when a person hires the services of a builder, or a contractor, for the construction of a house or a flat, and the same is for a consideration, it is a “service” as defined by Section 2 (o) of the Consumer Protection Act, 1986. The inordinate delay in handing over possession of the flat clearly amounts to deficiency of service. In Fortune Infrastructure & Anr. v. Trevor D’Lima & Ors., (2018) 5 SCC 442. this Court held that a person cannot be made to wait indefinitely for possession of the flat allotted to him, and is entitled to seek refund of the amount paid by him, along with compensation. 6.2. 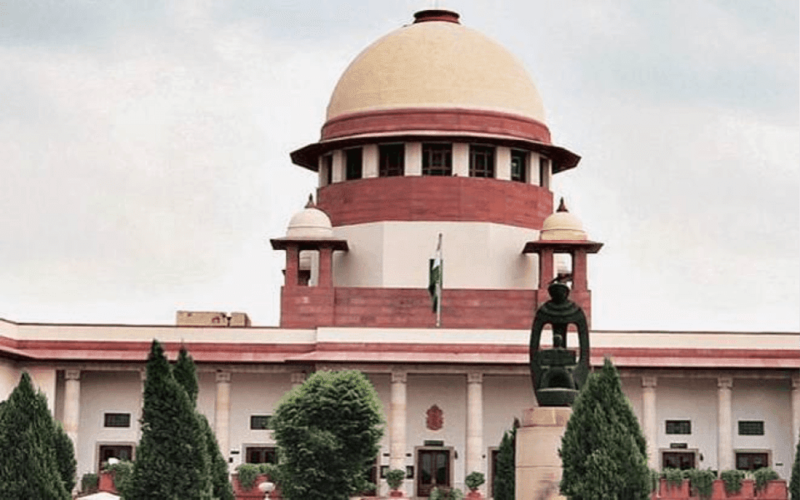 The Respondent – Flat Purchaser has made out a clear case of deficiency of service on the part of the Appellant – Builder. The Respondent – Flat Purchaser was justified in terminating the Apartment Buyer’s Agreement by filing the Consumer Complaint, and cannot be compelled to accept the possession whenever it is offered by the Builder. The Respondent – Purchaser was legally entitled to seek refund of the money deposited by him along with appropriate compensation. 6.3. The National Commission in the Impugned Order dated 23.10.2018 held that the Clauses relied upon by the Builder were wholly one-sided, unfair and unreasonable, and could not be relied upon. 6.4. A perusal of the Apartment Buyer’s Agreement dated 08.05.2012 reveals stark incongruities between the remedies available to both the parties. For instance, Clause 6.4 (ii) of the Agreement entitles the Appellant – Builder to charge Interest @18% p.a. on account of any delay in payment of installments from the Respondent – Flat Purchaser. Clause 6.4 (iii) of the Agreement entitles the Appellant – Builder to cancel the allotment and terminate the Agreement, if any installment remains in arrears for more than 30 days. On the other hand, as per Clause 11.5 of the Agreement, if the Appellant – Builder fails to deliver possession of the apartment within the stipulated period, the Respondent – Flat Purchaser has to wait for a period of 12 months after the end of the grace period, before serving a Termination Notice of 90 days on the Appellant – Builder, and even thereafter, the Appellant – Builder gets 90 days to refund only the actual installment paid by the Respondent – Flat Purchaser, after adjusting the taxes paid, interest and penalty on delayed payments. In case of any delay thereafter, the Appellant – Builder is liable to pay Interest @9% p.a. only. 6.5. Another instance is Clause 23.4 of the Agreement which entitles the Appellant – Builder to serve a Termination Notice upon the Respondent – Flat Purchaser for breach of any contractual obligation. If the Respondent – Flat Purchaser fails to rectify the default within 30 days of the Termination Notice, then the Agreement automatically stands cancelled, and the Appellant – Builder has the right to forfeit the entire amount of Earnest Money towards liquidated damages. On the other hand, as Clause 11.5 (v) of the Agreement, if the Respondent – Flat Purchaser fails to exercise his right of termination within the time limit provided in Clause 11.5, then he shall not be entitled to terminate the Agreement thereafter, and shall be bound by the provisions of the Agreement. “‘unfair trade practice’ means a trade practice which, for the purpose of promoting the sale, use or supply of any goods or for the provision of any service, adopts any unfair method or unfair or deceptive practice …”, and includes anyof the practices enumerated therein. The provision is illustrative, and not exhaustive. 6.7. A term of a contract will not be final and binding if it is shown that the flat purchasers had no option but to sign on the dotted line, on a contract framed by the builder. 7. In view of the above discussion, we have no hesitation in holding that the terms of the Apartment Buyer’s Agreement dated 08.05.2012 were wholly one-sided and unfair to the Respondent – Flat Purchaser. The Appellant – Builder could not seek to bind the Respondent with such one-sided contractual terms. 8. We also reject the submission made by the Appellant – Builder that the National Commission was not justified in awarding Interest @10.7% S.I. p.a. for the period commencing from the date of payment of each installment, till the date on which the amount was paid, excluding only the period during which the stay of cancellation of the allotment was in operation. In Bangalore Development Authority v. Syndicate Bank, (2007) 6 SCC 711. a Coordinate Bench of this Court held that when possession of the allotted plot/flat/house is not delivered within the specified time, the allottee is entitled to a refund of the amount paid, with reasonable Interest thereon from the date of payment till the date of refund. 8.1. In the present case, the National Commission has passed an equitable Order. The Commission has not awarded any Interest for the period during which the Order of stay of cancellation of the allotment was in operation on the request of the Respondent – Flat Purchaser. The National Commission has rightly awarded Interest @10.7% S.I. p.a. by applying Rule 15 of the Haryana RealEstate (Regulation And Development) Rules, 2017 from the date of each installment till 05.02.2017 i.e. till the date after which the Order of stay of cancellation of the allotment was passed; and thereafter, from the date of the Commission’s final Order till the date on which the amount is refunded with Interest. 9. We see no illegality in the Impugned Order dated 23.10.2018 passed by the National Commission. The Appellant – Builder failed to fulfill his contractual obligation of obtaining the Occupancy Certificate and offering possession of the flat to the Respondent – Purchaser within the time stipulated in the Agreement, or within a reasonable time thereafter. The Respondent – Flat Purchaser could not be compelled to take possession of the flat, even though it was offered almost 2 years after the grace period under the Agreement expired. During this period, the Respondent – Flat Purchaser had to service a loan that he had obtained for purchasing the flat, by paying Interest @10% to the Bank. In the meanwhile, the Respondent – Flat Purchaser also located an alternate property in Gurugram. In these circumstances, the Respondent – Flat Purchaser was entitled to be granted the relief prayed for i.e. refund of the entire amount deposited by him with Interest. 10. The Civil Appeals are accordingly dismissed, and the Final Judgment and Order dated 23.10.2018 passed by the National Consumer Disputes Redressal Commission is affirmed. The appellant is granted a period of three months from today to refund the amount to the respondent. All pending Applications, if any, are accordingly disposed of.